A simple beautifully proportioned one room guest house designed by an architect and built two years ago. High wood ceiling with fan and lots of light. Two sets of french doors open on to a screened porch. Standard double bed. 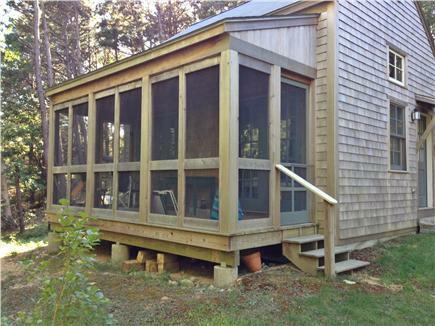 Large windows facing south look into a wooded area. Original works of art and Persian rugs. Bathroom with tiled shower. Alcove with sink, under-counter fridge, microwave, toaster oven hotplate, coffee-maker. No TV! A place to rest and read. 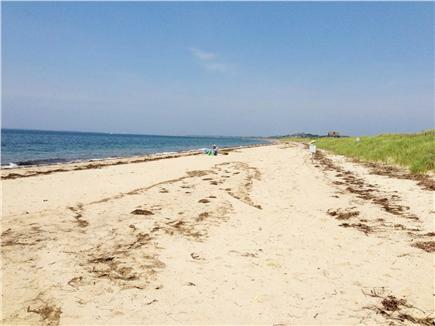 A wide spacious quiet beach is a ten minute walk down a country road. Provincetown can be seen across the bay. 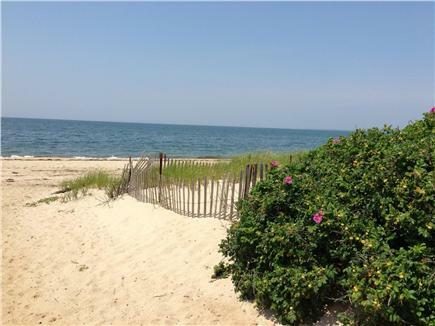 Secluded fresh water ponds and the great outer beaches in the National Seashore are an easy drive or bike ride. Refer to property # 16152 if additional space is needed. Additional availability info: Available off season December - Mid April each year. This is a Sunday to Sunday vacation rental. 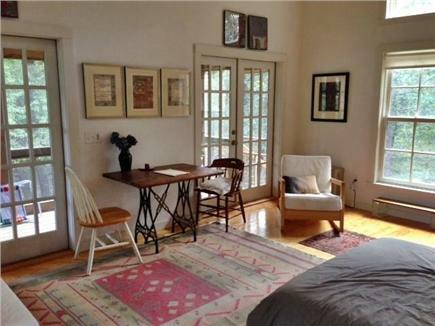 Long-Term Rental (1 month or more): Available for long term winter rental. Heat and utilities included. $1000 monthly. Quiet and cozy. Additional pricing info: Off season rates are negotiable, State and local taxes of 12.45% will apply. Thank you so much! It would be a pleasure to welcome you back next summer; you were wonderful renters. 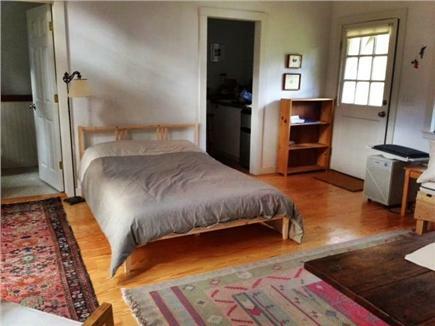 My husband and I spent a magical week in the little house, which features a beautiful, open, high-ceilinged room with lots of windows--but surrounded by woods, making it feel very private. Very quiet, and the screened porch is the perfect place to have dinner. Just a quick walk to the bay beach, in a very nice part of Truro. Only wish we could have stayed longer. Thank you, Megan! You both get a five star rating from me for being wonderful tenants. I am pleased to include this review of the Little House on the listing. I spent a week at the little house to do a meditation retreat and went back for two more weeks. The house is tastefully decorated and it feels isolated, which I liked. The kitchen is small with one burner to cook and a small refrigerator but it works. The house is well designed with very high ceilings and lots of windows. It is a short walk to Fisher Beach and there is a beautiful walk down to the jetties and Pamet Harbor. I went there every day. Thanks, Ron! I'll look forward to your return. You've nicely captured the special qualities of the Little House. I stayed with my partner at The Little House for one week. The place itself is very nicely built and a perfect small place for two people. 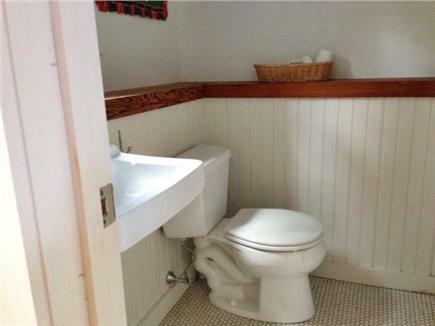 The house's host is great - kind and available but allows privacy. The screenporch is a great place for writing. Two weeks at the "little house"
We have just returned from a two-week stay at the Little house in Truro and we loved it! 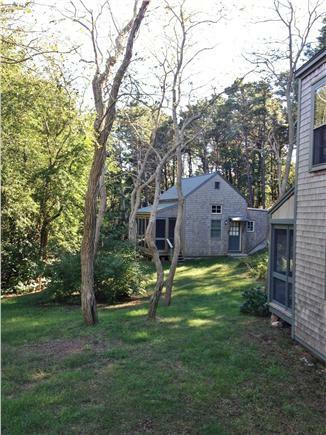 The house is located in a wooded area, on a quiet street with a less than 10 minutes walk to the beach. The place is well designed and has a good feeling to it. 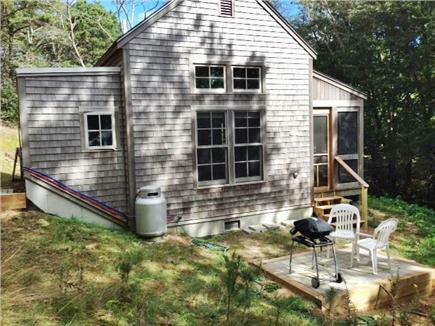 It's a small house perfect for two people who are looking for a nice and relaxing place to stay while visiting Cape Cod. Rosalind, the homeowner is very nice and helpful.